The German alphabet has 3 Umlauts – Ä, Ö and Ü. These are symbols which describe the sound made by 2 adjoining vowels ("um" = around / "laut" = sound). They are not in themselves separate characters of the German alphabet. ä = “ae” , ö = “oe” and ü = “ue” . The 2 dots above the letter are called diacritic marks and simply symbolize the “missing” e.
It's fine to write “ae”, “oe” and “ue” when you don’t have a German keyboard, although you can insert them in the form of symbols. However, if you're regularly doing German translations or working in the German langugage then this is going to drive you quickly nuts. If you're techno-savvy you can programme easy shortcuts on your keyboard (so I read), if not, do consider purchasign a German language keyboard! 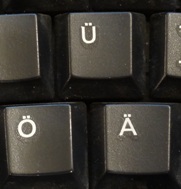 Hold down the Option + U keys simultaneously (U stands for Umlaut), then release, then type the vowel you want as an Umlaut (a, o, u), either in its upper or lower case form, as required. The web doesn’t like non-standard letters, and so if there is an umlaut in a person’s name, for example, you should write their name out in full for internet based communications. When am I going to come across an Umlaut? If you’re looking for more background and indepth linguistic information on the German umlaut and its origins, then Wikipedia (of course!) it probably a good starting point (See Wikipedia, Germanic Umlaut). But if you just need to know how to use them, then I hope that, for most of us, the information above will suffice! German currency – the Euro! German loan words – so familiar we forget they’re German! [?] Subscribe & get sent the latest news, tips & resources! 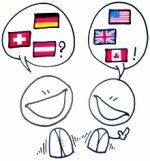 Welcome to my German translation website. This website has helped me build up a successful German translation business and a second, steady source of income. Click here to see how you could do the same! "It's really great to see a website dedicated to the translation of only a single language. There are too many general websites around on the web". "Thanks, your website is really helpful to read about advice on getting started as a German translator. Made the idea of getting an extra bit of money seem possible!..very grateful! "Ich bin auf deine Webseite gestoßen und finde die Seite super. Informativ, lebendiger Schreibstill. Ich würde gerne Dolmetscher (Deutsch- Chinesisch) werden und übe nun fleißig. Danke für deine inspiriernde Seite! Beste Grüße!" Got a question about German translation? Ask away and I’ll be delighted to help. Contact me and I’ll give you a quote for my professional services.